When choosing between products of equal value and price, 90 percent of shoppers will choose the brand connected to a social cause. Fifty-five percent of global consumers say they’d pay more for products and services from businesses that advance social and environmental causes. 88 percent of Americans are interested in hearing about businesses’ corporate social responsibility efforts. While more corporations are understanding the benefits of cause marketing, their next step is to determine which social impact organization will be the right partner. Follow these five tips to ensure your partnership will strengthen both parties. A good partner can make all of the difference in achieving cause marketing success, which is why it is crucial to find one whose brand aligns with yours. When your mission statements and values do not coincide, the partnership can actually damage your reputation. Such was the case in KFC’s partnership with the Susan G. Komen Foundation. KFC donated $0.50 for every bucket of chicken purchased during their Buckets for the Cure. Customers were not thrilled about raising money for medical research through purchasing of unhealthy food. After much backlash, both parties went their separate ways. Instead, strive for a partnership like the one between Breathe California, a nonprofit organization focused on reducing the impact of lung disease, and Clif Bar, an organic foods and beverages company. Both organizations focus on physical health and wellbeing. By choosing the right partner, you not only remain true to your company’s values, you’re also able to reflect them to your audience through your relationships and associations. Self-research can be a time-consuming endeavor. Instead, eliminate the time and effort of cause identification by turning to a company that specializes in matchmaking. One Hope Foundation, for instance, focuses on partnering companies with the right social impact organizations. They support hundreds of causes across all geographical locations, ensuring you’ll find the right partner in your location. One Hope does more than just find the right fit for your organization. They also help your organization determine the dollar-to-impact ratio that will be best for your company. This ratio takes the amount of money you contribute and then shows the impact that will be created with that contribution. Once your dollar-to-impact ratio has been determined and giving begins, the impact you’re creating is clearly outlined in a personalized report. One Hope Foundation also helps your organization effectively market the change you are creating. They help you tailor your messaging to motivate your consumers to support your brand and thereby give to the causes you support. Social media has played a big role in promoting the partnership between Paul Mitchell and Bright Prink, exposing the breast cancer organization to new audiences and showcasing Paul Mitchell’s involvement in the social sector. 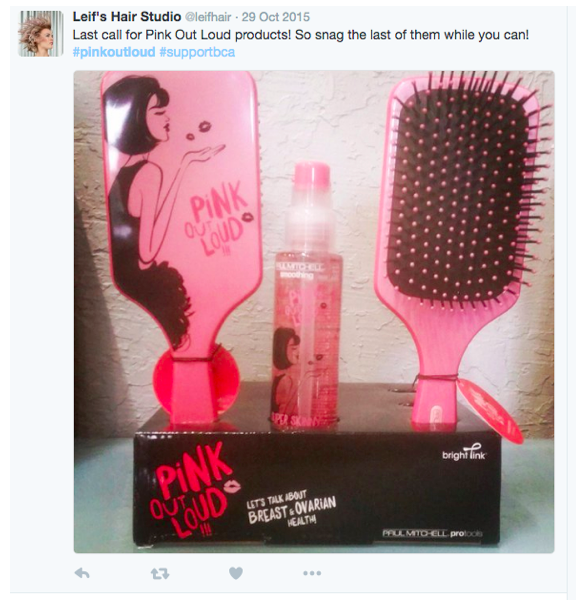 Tweets, such as the one below, help Paul Mitchell advertise their Pink Out Loud! products while also showing support for breast cancer awareness. With dozens of causes out there, a great way to narrow down the options is to turn to the people who you’re hoping will support the cause: your employees. Asking your employees to help you pick a cause to support can be an opportunity to better understand what matters most to them. Try sending a survey out to see which causes they are most passionate about. It can also lead to an improvement in employee morale. According to one survey, employees aged 21-35 who volunteer are two times more likely to be “very satisfied” with their career development. Cause marketing isn’t just something that is good to do, it is something every corporate business should do. With the potential to reach a whole new pool of consumers while advancing social good, your organization only stands to benefit from taking on a corporate social responsibility program. With these tips in hand, you are well on your way to finding the perfect cause to support.